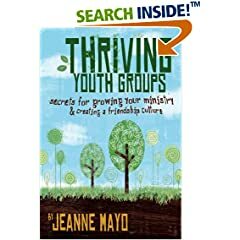 Jeannie Mayo is a veteran of youth ministry. She has served for something like 35 years. She’s led groups from tiny to huge and she has a lot of really great stuff to share. Thriving Youth Groups is a great book to show us young youth pastors that there is really nothing new under the sun. Jeanne’s Central point is that if you want to have a growing youth group, it needs to be a welcoming place. More important that flash and hype, does any feel loved and connected to the youth group family? This is something that has to be asked time and time again and youth pastors need to constantly evaluate the friendship factor in their student ministries. If you are looking for a book that will open your eyes to new and fresh student ministry ideas this isn’t it. If you want a book that really says what the basic and most important elements of any ministry are, then this is a great reminder. I read this book like it was a friend talking to me over coffee. A coach that I was meeting with who really cared about my health as a pastor and the health of the ministry that I am leading.